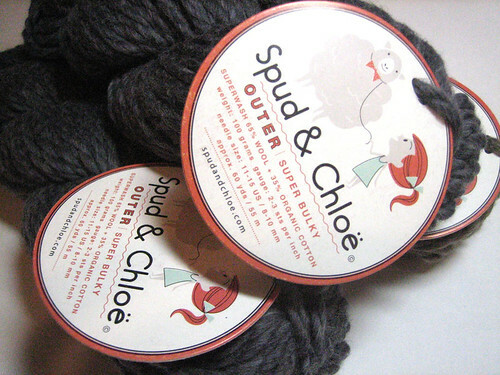 I think the yarn gods are looking out for me...shortly after buying the Spud & Chloe patterns a friend of mine showed up on my doorstep to drop off a little shopping bag with a present inside. It was 3 skeins of the Spud & Chloe Sweater yarn!! The exact colors that I need to make the Hooter Hat!! I forget how my friend acquired the gift certificate (I think she won it?) to the LYS that carries the S&C line, but she had no use for it since she doesn't knit and the shop really had nothing that suits her interests. She remembered a brief conversation that we had about me "ranting" about the Sweater yarn and thought she might as well put the certificate to use and get the yarn for me. She sheepishly admitted that if we had not had that conversation (and if she had not remembered said convo), she would have chucked the certificate onto her (extremely cluttered) desk and would have completely forgotten about it and it would have most likely never get spent (gasp!). what a great friend you have. I was looking at the spud and chloe patterns after your post yesterday and there are a couple I want to buy. I need to wait till I start my new job first. I completely agree! I'm just happy and really lucky that she even thought of me when she realized that she didn't have a use for the gift certificate! Ooohh...what patterns are you thinking of?? There's a few other patterns I'm wanting, but I wanted to wait a little before I consider getting them...I didn't want my knitting to-do list to get any longer!! I know!! I think The Universe wants me to make this hat! !